One of the first wine tables I stopped at while at the UNLVino grand tasting belonged to Heitz Wine Cellars. The winery was established in 1961 by Joe and Alice Heitz. At the time, there were less than 20 wineries in Napa Valley so they were kind of pioneers. The winery is located in Spring Valley in the eastern hills of St. Helena. Currently, the second generation, Kathleen Heitz Myers and David Heitz, operate the winery. Heitz practices organic and sustainable agriculture. "Today at Heitz Wine Cellars, we are proud to be conscientious stewards of the land, working to preserve the Napa Valley winemaking heritage for generations to come." (Kathleen Heitz Myers) They also limit their production, planning to make no more than 40,000 cases annually. Quality not quantity is one of their objectives. I had the chance to taste their Chardonnay and four different Cabernet Sauvignons. All five wines were quite good, albeit the Cabernets are not cheap. The 2007 Heitz Cellars Chardonnay ($20) is made from 100% Chardonnay and has been aged for about four months in 40% new French oak. It does not undergo malolactic fermentation. The idea behind this wine is to allow the fruit to shine forth, rather than conceal it behind too much oak. I think they succeeded. The Chardonnay had an alluring nose of citrus, especially some lemon and grapefruit. The citrus flavors came forward in the taste as well, though there was also flavors of green apple and melon. The fruit was dominant, with only a touch of oak providing some body and a light cream to the wine. It was crisp and had a fairly lengthy finish. This is the style of Chardonnay I prefer and I very much enjoyed this wine. For the price, this is a good buy, especially considering the complexity of its taste, and its lush fruit flavors. The 2004 Heitz Cellar Cabernet Sauvignon, Napa Valley ($42) is made from 100% Cabernet Sauvignon and spends three years in oak (1 year in American oak, 2 years in French oak). This wine had a light red color and nice red fruit smell, some cherry and raspberry. On the palate, there were bright red fruit flavors with a hint of spice. The tannins were mild and it had a moderately long and smooth finish. In some respects, this reminded me of a silky Pinot Noir rather than a heartier Cabernet. It could easily be drank on its own, though would pair well with food too. Though I enjoyed this Cabernet, I think it is a bit pricey for what you get. The 2004 Heitz Cellars Bella Oaks Vineyard Cabernet Sauvignon ($65) is made from 100% Cabernet Sauvignon and spends three and a half years in oak (1 year in American oak, 2.5 years in French oak). This vineyard consists of about 18 acres in the Rutherford district. This wine was a darker red color than the first Cabernet and had a more intense nose, with darker red fruit smells. On the palate, there were lush and complex flavors of black cherry and plum with spicy undertones. It was a very smooth wine, with restrained tannins, and a lengthy and satisfying finish. This was a silky and hedonistic wine that really impressed me. It would please either with or without food. This is a wine I think is worth its higher price. We move on to a different vineyard. The 2003 Heitz Cellars Trailside Vineyard Cabernet Sauvignon ($85) is made from 100% Cabernet Sauvignon and spends three and a half years in oak (1 year in American oak, 2.5 years in French oak). This vineyard is also located in the Rutherford district so you might expect it would be similar to the Bella Oaks but that was not the case. This was a drier wine, with stronger tannins, so I would drink this most often with food. It had complex flavors, with intense dark berry flavors, some leather and much more prominent spice than the Bella Oaks. Its finish was lengthy, with an even spicier flair. I enjoyed this wine, though it was very different from the Bella Oaks. This is the wine I would pair with a fine steak, savoring sips between bites. The Bella Oaks would be something I would enjoy alone, sipping slowly with company, conversing between sips. Finally, I had the top of their line, the 2004 Heitz Cellars Martha's Vineyard Cabernet Sauvignon ($150). This is made from 100% Cabernet Sauvignon and spends three and a half years in oak (1 year in American oak, 2.5 years in French oak). This vineyard consists of about 34 acres in the Oakville district, near the Mayacamas foothills. The vineyard also grows a proprietary Cabernet Sauvignon clone that is well known for small berries with a concentrated flavor. This was a very dark wine, a rich purple color, with an alluring nose of violets, black cherry, blackberry, and spice. A very intriguing smell that beckons you to just sit and enjoy the aroma. The tannins were more moderate in this wine than the Trailside and the fruit, especially black cherry and plum, seemed a bit more lush and bright. There was plenty of spice as well, though well integrated with the rest of the flavors. Everything seemed to work in a harmonious structure. providing an elegant and refined wine. This is a wine that you can probably cellar for quite a time and I bet the changes it undergoes over the years will be quite remarkable. Yes, it is the priciest wine of the group but should not disappoint if you are willing to make the splurge. The Heitz wines were generally impressive and if you are seeking a higher end California Cabernet, they they are worth checking out. Plus, I think their Chardonnay is a good value, a Chardonnay that is not concealed by an overabundance of oak. Though starting off the UNLVino tasting with such good wines really set the bar high for the rest of the tasting. In my prior post on the UNLVino grand tasting event, I mentioned that I had found a special drink that really impressed me but also was a bit of a disappointment. Fortunately, my disappointment has lessened after I did a bit of additional research when I returned from Vegas. What might surprise you is that this special drink I found at a wine tasting event is not even alcoholic. One of my favorite beverages is fresh brewed, unsweetened iced tea. It is something I drink nearly every day, all year round. I much prefer it to soft drinks as it is very refreshing without any carbonation or sugar. I don't like when restaurants only serve iced tea during the summer as it should be a year round drink. I have never before liked bottled iced teas. Most bottled iced teas are sweet and I usually avoid them. Though some bottled iced teas are unsweetened, they just don't taste right. They certainly do not taste fresh brewed. They almost seem artificial, and even sometimes carbonated. I have tried many different brands, and none of them really satisfied me. Until recently. While perusing the various tables at UNLVino, checking out the wines that were available, I came upon The Republic of Tea where they had some bottled iced tea. I had some familiarity with their products, having previously purchased some of their loose-leaf teas at Whole Foods. But had never seen their iced tea before. I was very skeptical as I scanned the various flavors available. I thought they might be too sweet or taste artificial. I was very wrong. I first tasted the Raspberry Quince, one of their unsweetened, black teas, and I was shocked. It was so very different than what I expected. It actually tasted like fresh brewed iced tea. There was no carbonation, no artificial taste, no sweetness. The fruit flavors were there but they were more subdued, enhancing the taste rather than overwhelming. It had an amazing taste, exactly what I have been seeking for a long time. If I had to undergo a blind taste test, I would be unable to tell that this iced tea came from a bottle. I tried a number of their other flavors and my feelings were the same. They were all delicious, and tasted just like fresh brewed. I was so delighted to have discovered this wonderful drink. It is also good to know that the iced tea is organic, has no calories, no carbohydrates, no sodium, no artificial colors, no artificial flavors, and no preservatives. They are available in either Black or Green Tea in flavors such as: Black Tea--Ginger Peach (also in decaf), Raspberry Quince, Mango Ceylon, Blackberry Sage, and Republic Darjeeling; Green Tea--Passion Fruit, Blueberry Green Decaf, and Pomegranate. Rather than have fruit juice added to the tea, generally the fruits are dried and brewed with the tea leaves, thus adding their flavor without any sugar. All of the teas, except the Republic Darjeeling, were available in 500ml glass bottles ($4.75). And that is where my disappointment initially came. I was told that the glass bottles were only available at hotels, restaurants and spas. They were not available in any retail stores and they had no plans to do so in the future. So, though I had found this amazing iced tea, I would not be able to buy it. Very frustrating. The Republic Darjeeling came in a plastic bottle and I was told it might be available in some retail stores. So I endeavored to hunt for it once I returned home, greatful at least that I might be able to find one of their iced teas. My search met with much greater success than expected. First, you can order the iced tea through their website and it appears you can buy both the glass bottles and plastic ones. The 12oz plastic bottles cost $2.79 each plus they have more flavors available than what I saw at UNLVino. So, no matter where you live, you should be able to order this iced tea. If you love fresh brewed, unsweetened iced tea, then these bottled iced teas are going to satisfy you. I am very picky when it comes to my iced tea and I was thoroughly impressed with these drinks. They are a bit pricey but they are also a high quality product. Check them out. There are few restaurants that really seem to transport you elsewhere, which immerse you in a homey ambiance that makes you feel as if you were in a different country. Such restaurants occupy a special place and when they also serve excellent food, then you have found a unique and compelling culinary destination. Dali Restaurant is one such place and I must add Tangierino to that short list too. Tangierino is a Moroccan restaurant located in Charlestown, not far from City Square. The Chef/owner is Samad Naamad, once an interior designer, who has created quite an intriguing restaurant. Besides the dining area there is the Marrakesh salon, a wine bar, and the new Koullshi, located in the basement area, which is a "Bedouin" room where you can smoke cigars or shisha pipes, also known as hookahs. The restaurant is absolutely beautiful, very tastefully decorated with colorful tiles, gauzy curtains, hanging lanterns, soft cushions, intriguing pictures, and much more. It avoids being kitschy and you feel as if you might be dining in North Africa, as if you have stepped through a portal to another land. It is a very romantic spot, with its muted lighting and special curtained-off tables. Rather than just eat a meal there, you will have a dining experience. As part of a media dinner, I sat with our group in a small private room, on comfy couches, that certainly made for an appealing experience. Tangierino has an extensive bar and wine selection, with plenty of wines priced from $30-$50. They even have a fairly long list of half-bottles plus a couple Sakés. Their cocktail list has numerous interesting choices, many with a Moroccan flair. The Sangria Sultana is like a traditional Sangria but with the addition of figs. It was one of the better Sangrias I have had, not too sweet and without a heavy alcohol taste. The fig flavor made a tasty addition and I would order this again. The Moroccan Mojito also has some added fig syrup which made this cocktail quite delicious. The Snake Charmer is another interesting apertif made with St. Germain, Chambord, and Champagne. Prior to the start of our meal, adding to the ambiance, a man came by to let us wash our hands. He poured warm, rose-scented water over our hands into a basin. Another item that added to the ambiance, which came later during the meal, was a belly dancer. She was quite beautiful and very skilled, her sultry moves adding to the sensuality of the dining experience. The menu is divided into Old World (the more traditional and authentic dishes) and New World (more modern dishes with a Moroccan flair) items. Appetizers range from $8-21 (averaging about $15) and entrees range from $19-$34 (averaging $26-27). There are plenty of appealing options, many that interested me. We had a set menu for the evening, a five course meal so we did not get to choose anything. Four of our courses seemed to be appetizers from the menu. We began with a 4 Layer Tuna Tartare ($16), which has layers of spicy tuna, honey, mango, guacamole, scallions, and cucumber. This is one of the New World selections. As a tuna tartare dish, I don't really think this worked. There were too many flavors and textures, making for a very busy dish and the tuna got lost in all of it. It tasted fine but I don't think it did justice to the raw tuna. In a tartare dish, I want the flavor of the fish or meat to be very noticeable, and for the additional ingredients to complement, not disguise the fish or meat. The Chicken B’stila ($12), an Old World dish, was quite delicious. A delicate and flaky phyllo dough covered a flavorful mix of chicken, toasted almonds, and spices. The phyllo was covered with some cinnamon and sugar making this both a sweet and savory dish. You might not think the sweetness would work with this dish but it actually does very well. I could have easily eaten a second plate of these as they were so good. Next up, was a Moroccan-Sicilian Eggplant ($13), another Old World dish, which was filled with parmesan, mozzarella and ricotta cheese and topped by a charmoula sauce. Those who like eggplant seemed to really enjoy this dish. The sauce was interesting, almost resembling a red sauce in its appearance, but very different in taste. It was rich with flavor, the various spices combining into a delicious melange. Then we had the Blazing Beef Tenderloin ($15), a New World dish, topped by a harissa teriyaki sauce, and accompanied by a vegetable roll and a cucumber/mango salad. This was an excellent dish, very tender beef with an amazing sauce. The sauce was both spicy (from the harissa) and sweet and was perfect atop the beef. This is another dish I could have easily eaten seconds. The harissa went so well with the teriyaki sauce that I might try to make it at home. I make my own teriyaki sauce so it would be quite easy to add some harissa. We then adjourned downstairs, to Koullshi. This area is just as amazing as the upstairs, definitely with a compelling ambiance. It is a place to smoke shisha and cigars, in a very comfortable venue. There is a bar down there, as well as a large cigar humidor where you can purchase your favorite cigars. One of the most intriguing areas is the "Bedouin cave," a real small cave where a few people can relax in comfort. We hung out in one of the private rooms, where we had drinks, desserts and some shared one of the shisha pipes. The desserts were quite good and my favorite was the Chocolate Caramel Pyramid, which was actually shaped like a small pyramid. I have seen similar looking desserts befiore and they are usually rich and heavy. But this was not, instead being incredibly light, almost mousse-like, though even lighter. It was not overly sweet and had a nice chocolately flavor. A perfect. light ending after you have already gorged yourself upstairs. For a weeknight, it was quite busy and I fully understand why. Tangerino impressed me and I will certainly return soon to check out the rest of their menu. I recommend you check out Tangierino, especially if you are seeking something different. You can learn much about a grape by tasting several different wines, comparing and contrasting different styles, blends, terroirs and more. The same grape can sometimes make radically different wines, or it can create very subtle differences. That is part of what makes wine so exciting, how a single grape can create such diversity. It is so exciting to try new wines, to see how that wine expresses the nature of the grape. I have recently done some comparison taste testing with several Petite Sirah wines from California. P.S. I Love You (the P.S. standing for Petite Sirah) is an advocacy group in California whose Mission Statement is: "To promote, educate, and legitimize Petite Sirah as a noble varietal, with a special emphasis on its terroir uniqueness." Their website provides plenty of information about Petite Sirah and its California producers. It is a wealth of resources and provides a great template for others that might want to start their own advocacy group for other specific grapes. Through them, I received some wine samples from several different producers. Petite Sirah originated around 1880, when Dr. Francois Durif, a grape nurseryman working in southern France, named a new grape after himself. This Durif was combination resulting from two other grapes, Peloursin and Syrah. It is not a hyrid though. Commonly, Petite Sirah wines are very dark in color, relatively acidic, very tannic, and often have flavors of black pepper and herbs. Because of its high tannins, it ages well and can easily last for twenty years or more. Back in 1990, after years of declining acreage, there were only about 1400 acres of Petite Sirah remaining in California. Yet it saw a new resurgence so that now there is over four times as much acreage. Plus the number of producers have greatly increased too. There are now over 370 producers, six times as many as existed about ten years ago. Petite Sirah is becoming more and more popular with consumers, and with good reason. With all of the samples I received, I tasted them with a group of my wine buddies so they provided some input to me as well. I decided to begin my review with my favorite of the Petite Sirah wines I tasted. This was the 2006 Michael David Petite Petit, Lodi ($28). This wine is blend of 85% Petite Sirah and 15% Petite Verdot and spent about 14 months in French oak. I was initially wary of this wine due to its cartoony label, which I thought might be a marketing gimmick that hid an average wine. So I was very pleasantly surprised that this wine was so delicious. Michael and David Phillips are the fifth generation of growers in Lodi and currently have about 500 acres of vineyards. "The vineyards are irrigated by the Mokelumne River, which carries crystal-clear water from the Sierra Nevada Mountains, depositing minerals into the rich soils upon which the grapes thrive. Though not certified organic, Michael~David Winery strives to use all natural methods including integrated pest management, beneficial insects for pest control, trellising, leaf pulling and natural mined sulfur for mildew control." This was a dark purple colored wine with an alluring smell of blueberry and vanilla. It was a silky smooth wine, with very restrained tannins, and pleasant flavors of ripe plum, blueberry, and black cherry. On the long finish, there were some mild vanilla and spice notes. I think the Petite Verdot tamed some of the tannic nature of the Petite Sirah. This is a wine I could drink on its own or with food. My friends all very much liked this wine as well. No one had anything negative to say about it. The 2005 Michael David Earthquake Petite Sirah ($28) is made from 100% Petite Sirah and I did not enjoy it like I did the Petite Petit. It had an off-putting medicinal smell to it. On the palate, there was prominent eucalyptus and Christmas spices. There were some dark berry flavors but they were underlying the other flavors. The tannins were moderate and it did have a decently long finish. But the taste just was not pleasing to me and my friends were not too keen on this wine either. Like the Michael David wines, I had two wines to taste from the Stonehedge Winery. This winery was established in 1992 by the Shahabi Brothers. This is a small, family winery nd they have "made the gentle care of the grapes from vine to bottle priority one." And like the Michael David wines, I really liked one of the wines and was not so impressed with the other. The 2005 Stonehedge Reserve Petite Sirah ($34) had too strong of a eucalyptus smell and that also came out on the taste as well. Spice notes were very prominent and the fruit flavors were very subdued. The tannins were restrained and it had a moderately long finish. I think the dominant eucalyptus detracted from my enjoyment of this wine. And my friends also were not real pleased with this wine. The 2005 Stonehedge Terroir Select Petite Sirah ($26) though was much more compelling. The grapes come from the Pallini Ranch vineyard in Mendocino, where the vines are some of the oldest in California. The wine spends about 18 months in American oak and has an alcohol content of 14.2%. It had a rich, dark purple color and an intriguing nose of dark berries, spice and leather. It was a very big and bold wine, with a complex melange of flavors. Blackberry, black cherry, vanilla, leather, and dark spices. The tannins were prominent so this is very much a food wine. It had a long, satisfying finish and was a favorite among my friends. This is the type of wine that I think epitomizes what many see as typical Petite Sirah. And it surely presents an appealing model for that grape. The Lava Cap Winery is a family owned and operated winery, founded in 1981, in the Sierra Foothills of Northern California. They use old world, labor-intensive techniques and sustainable agricultural practices. The name “Lava Cap” reflects the unique volcanic soil of the vineyard. The 2005 Lava Cap Granite Hill Petite Sirah Reserve ($30) has spent about 18 months in French oak and has an alcohol content of about 14.9%. Only 1471 cases of this wine were made. This wine reminded me of the Stonehedge Terroir Select, another big wine with intense flavors. There were differences as well. The nose and taste had a bit more blueberry and ripe plum flavors and the tannins were more moderate. It also tasted almost a bit sweet, which turned off some of my friends but which I enjoyed. So interesting to see how different Petite Sirah can be, dependent on terroir and wine making. The Victor Hugo Winery is a small, family owned and operated winery in Paso Robles. I have previously tasted a number of their wines and have enjoyed all of them. I have come to expect very good wines from this winery. I have yet to be disappointed and their Petite Sirah was not an exception. The 2006 Victor Hugo Petite Sirah ($22) has spent about 18 months in American oak and has an alcohol content of 13.8%. Only 1131 cases of this wine were produced. It had a rich, dark purple color and an alluring smell of lush dark berries. On the palate, this was a very smooth wine with delicious flavors of ripe plum, vanilla, blackberry and spice. It had a lengthy and pleasing finish. There was plenty of complexity and character, especially for the price. I found this to be a wine I could enjoy with or wthout food, and it was a very good value as well. Overall, I found some impressive Petite Sirahs, enough to make me seek out more of them to taste. If you have never tried this grape, you should do so. Even if you think you know Petite Sirah, you might benefit from trying different Petite Sirah wines as you might be surprised by what you find. What are your experiences with Petite Sirah? Enjoy Mother’s Day, May 10, 2009 at BiNA Osteria. Celebrate Mother’s Day, May 10, 2009 at Aura with this special menu. Reservations Recommended so please call 617-385-4300. One of the most intriguing elements of the VIP event was a special comparison tasting of five rare, heritage breeds, hosted by Arie McFarlen of Maveric Heritage Ranch Co. This company was created to preserve endangered breeds and they have a rather unique philosophy, "Eat it to Save It." In essence, they feel that the animals can only be saved by giving them a purpose, to be eaten. Though at first you might think that is contradictory, take some time to consider it. The idea actually makes a lot of sense. And the philosophy does seem to be working to help bring back endangered breeds. McFarlen currently work with five breeds, including Mulefoot, Guinea, Ossabaw Island, Wessex Saddleback and Red Wattle. You can purchase live hogs to own yourself, or you can just order pork for eating. Their pork has been certified "Humane" by the Animal Welfare Institute. Their pigs have never been fed antibiotics, hormones or by-products. Obviously it is vitally important to save these endangered breeds. Sadly, in November 2008, a fire destroyed an old barn at the Maveric farm, trapping and killing numerous animals, including a stallion, several Mulefoot hog sows with their litters of piglets, a Wessex saddleback boar, a Guinea hog boar and a number of cats. Rather than be defeated by this setback, Arie surged forward, her passion to protect the heritage breeds only burning brighter. She established the Endangered Hog Foundation with a mission of preserving nine critically endangered hog breeds: Mulefoot, Guinea, Wessex Saddleback, Gloucestershire Old Spot, Large Black, Red Wattle, Ossabaw Island, Tamworth, and Hereford Hogs. The Foundation's work includes securing and distributing funds to assist breeders in DNA research, establishing breeding protocols, maintaining funds for herd rescue, public education, sponsorship of breeding animals and the importation/exportation of pigs to reinvigorate existing herds in the US, UK & Australia. You can assist the Foundation's efforts in a myriad of ways: "Be it a cash donation, assistance at the farm, serving pork from one of our rare breeds, spreading the word or using whatever special talent you have, you are a vital part of our conservation effort." This is definitely a good cause and I encourage my readers to lend their support in any manner they can do so. There were five large trays of pieces of pork, each from a different breed, all with different sauces or marinades. You served yourself, tasting and comparing the succulent meat from the different pigs. If you think all pork is the same, then you would be very wrong. Many people are only used to the pork you buy at your local Stop & Shop or other such grocery store. All of that pork looks and tastes alike. But you would be amazed at the myriad of flavors within these heritage breeds. All five of these pigs were very different, including their look, texture and taste. This type of comparison testing is extremely educational, showing you exactly how varied pork can be. I found all of the pork to be very delicious though my favorite was the American Mulefoot. It just had the flavor that most satisfied me, almost a sweetness to the meat. But it is the variety of flavors in the different breeds that most impressed me. I was also intrigued about learning more about the American Mulefoot. For example, it is the only pig breed native to North America. It also has a solid hoof like a horse. But there are only about 300 of these pigs in existence. Don't let any of these endangered breeds vanish. Don't let this delicious pork disappear. Please lend support to the Endangered Hog Foundation. The theme for Wine Blogging Wednesday #57 has now been announced. Jeff of Good Grape is this month's host and he has chosen a meaningful theme, California Inspiration. This theme is partially an homage to the legendary Robert Mondavi, who passed away almost a year ago. Your task is to revisit a California wine that is meaningful to you in some way and then tell a story about that wine. The story should have a beginning, middle and end though any type of story is permitted. I am sure this should be easy for most wine lovers, as we all have such stories within us. Certain wines remain locked in our memories for various reasons. So now is the time to release those memories and share the story within everyone. As a bonus, the best story, as judged by Jeff and Lenn, wins a 1-year subscription to Sunset magazine, a lifestyle magazine for California and the West Coast. On or before Wednesday, May 13, post your tasting review on your blog and then email the link to Jeff. If you lack a blog, just add your review as a comment to the original post. Yes, Joel Cox is getting ready to butcher that pig in front of hundreds of people. This was but one part of the intriguing and delicious Cochon 555 event which was recently held at the Liberty Hotel. In a later post, you will be able to see some photos of Joel's work. The basic idea of Cochon 555 was: "Five Chefs, Five Pigs, Five Winemakers.” Five top local chefs each received a 70 pound heritage pig which they could cook anyway they desired. The chefs's dishes would be judged based on the creativity and flavor of their dishes and the winner would be crowned the “Prince of Porc.” There was a panel of judges plus all of the attendees got a vote as well. The chefs included: Jamie Bissonnette of Toro, Jason Bond of Beacon Hill Bistro, Tony Maws of Craigie on Main, Joseph Margate of Clink, and Matthew Jennings of Farmstead Inc.
Five wineries also showcased their wines, including: Patz & Hall, Krupp Brothers, Chase Family Cellars, Meander Wines, and Westport Rivers Vineyard and Winery. My time at Cochon 555 began a bit earlier than many of the other attendess as I spent a little extra money to purchase a VIP ticket, and it was well worth it. The VIP ticket granted you access earlier to an exclusive food and drink event including more wine, cheese and pork. South End Formaggio presented two tables of varied and delicious cheeses and crackers. I sampled plenty of the cheeses, savoring all that I tasted. There was not a bad one in the bunch. I have long been a fan of this store and they have an excellent selection of artisan cheeses, as well as other gourmet foods and wines. If you visit the South End, then you should check out this store. On their tables were also containers of Chicharrones, supplied by 4505 Meats. Created by Chef Ryan Farr in San Francisco, they are supposed to be: "Drawn from only the best local sources, our Chicharrones contain natural pork, sea salt, cane sugar, and the finest chiles." But what are they? Thin, crunchy, and tubular in shape (thought they were not hollow), they were very light but had an explosion of flavor. Their saltiness was most prominent, though not overly so, and there were hints of sweetness too. I found them to have a bit of smokiness in the taste as well. All I know is that I devoured a fair amount of them, finding them quite an addictive snack. There was a sixth winery in the VIP room, Elk Cove Vineyards from Oregon. Elk Cove is a family owned and operated winery that produces fine Pinot Noir, Pinot Gris, and Pinot Blanc. They had five wines available for tasting, including their 2007 Pinot Blanc, 2007 Pinot Gris, 2007 Pinot Noir Willamette Valley, 2007 Pinot Noir Mt. Richmond, and 2006 Pinot Noir Roosevelt. All five of these wines impressed me. The two whites (both about $19) had plenty of flavor and character, showing how both of these grapes can really make very good and distinctive wines. And all three Pinots were quite tasty, silky smooth and full of lush flavors. There were the type of Pinot Noirs that really please me, hedonistic wines yet restrained as well. Rather than boldly attack your palate, they seduce you, and they worked their magic on me. I am going to pick up some of these wines in the near future, and will provide fuller reviews. They definitely get my full recommendations. Besides the fine wine, I was also quite intrigued by Domaine de Canton, a French Ginger Liqueur (about $32). The liqueur is made from fresh baby Vietnamese ginger which is then macerated with various herbs and spices. Then, some eau de vie, VSOP, XO Grande Champagne Cognacs, Tahitian vanilla, Provencal honey, and Tunisian ginseng is added to the mixture. It is made by hand, in small batches, and is all natural. Certainly a curious and intriging blend of ingredients. I tried the liqueur on its own, in a Domaine de Canton Cocktail, and in a Watermelon Mojito. On its own, it has a strong ginger flavor and a bit of sweetness, though not cloyingly so. There were some underlying spice notes as well. Both cocktails were delicious, with the ccompanying ginger flavor enhancing the rest of the tastes. It added only a bit of sweetness to the cocktails. I really liked the Watermelon Mojito. They passed out some small sample bottles of the liqueur and I have since made cocktails at home with it. I mixed it with a non-alcoholic mojito soda as well as trying it with a few different juices. In all of the drinks, the ginger flavor seemed to enhance the drink, making it quite refreshing. My family and friends who tasted the drinks all enjoyed them as well. I think this liqueur would make some fun summer cocktails and I look forward to taking a pitcher of them to a BBQ or beach party. There was one additional item at the VIP area that I want to mention, a comparison tasting of pork from five heritage pigs. But that deserves its own post. Mothers work all-year-long taking care of us… and on the one day a year that we’re supposed to celebrate them we yank them out of bed, plop them in a buffet line and feed them over priced breakfast food. This is not good for our Mothers, nor the millions of tiny innocent eggs sacrificed that possibly aspired to be in a quiche, flan or be part of a luscious meringue topping! Burtons Grill, located in Boston’s Back Bay, has decided to take on these worthy causes by bucking the trend of the typical Mother’s Day Brunches and open their doors for Dinner all Day long! “Honestly, we wanted to skip the long waits and high priced breakfasts that have become part of the Mother’s Day culture,” said Kevin Harron, CEO of Burtons Grill. Filet Mignon: 9 oz. aged angus beef, seasoned and grilled, served with Worcestershire herb butter, seasonal vegetables and your choice of potato or herbed rice. For reservations please call 617-236-2236 or visit www.burtonsgrill.com. Well, I am going to break that rule a little, sharing some of my recent Vegas experiences. But don't get all excited, thinking you are going to hear a bunch of salacious stories. I am only going to share my food and drink experiences with you. The rest of what I did will remain confidential, as it should. Last year, I attended the 34th Annual UNLVino Wine Tasting and I had such a good time that I decided to return this year, to their 35th Annual Event. The Grand Tasting event was once again held at the Paris Las Vegas Hotel, which is a good venue for the event. I entered during the trade hours, when it was quieter, so I had plenty of time to check out the many wines available. Though even when the public entered, it was not as busy as last year. I heard that ticket sales had been 50% less this year, an effect of the rough economy. The event was set up a bit differently than the previous year. The entry room contained the auction area at the back, and there were a few vendors on the side walls. The tasting room was quite large, though I believe smaller than last year, yet there still were over 1000 wines available for tasting. As last year, there was plenty of space between the different rows of tables, making it feel far less crowded. Once again, the selection of available wines was generally comparable to that of the Boston Wine Expo, except that the UNLVino had more high end wines available. There was also plentiful food available, more than just cheese and crackers. Besides the main food tables, there were a few restaurant vendors scattered about, offering samples. For example, Koi Restaurant offered an extremely delicious tuna tartare atop wonton crisps. One of the things that really impressed me about this event is that they really showcase Saké, more than most other grand wine tastings. There were seven tables of Saké, all situated in a line against the back wall. It is great to see so many people being exposed to the delights of Saké. I tasted many and will be posting a number of Saké reviews in the near future. I attended the auction, which was divided into a silent auction and a live auction, as I usually enjoy such auctions. There were a total of fifty items available, a number of which were primarily for locals such as restaurant gift certificates and winery visits. But I did find one item of interest, three bottles of Mizbasho Sparkling Pure Saké. I had tried this in the tasting room and was very impressed with it. I ended up being the only person who bid on them, so I got them for an excellent price. I'll tell you more about this Saké in the near future. In addition, I will be posting numerous other wine reviews soon. As well as the review of a special drink that really impressed me, but also was a bit of a disappointment. Stay tuned for all of it. I should also mention one more intriguing aspect of this event, an artist, Jessica Galindo, who was displaying some of her artwork. I was drawn to her heart-related works, finding them both evocative and compelling. From speaking with Jessica, her passion was clear and she is very personable and charming. I think she is quite talented and I highly recommend that you check out her work on her website. I purchased one of her paintings and may buy more in the future. I hope to head back to Vegas next year for the 36th edition of UNLVino and I recommend that other wine lovers check it out as well. $38 Per person. A Gratuity of 20% will be automatically added to your bill. Tired of the same old Mother’s Day bouquet and bland brunch? This year, show Mom you really care by skipping the hotel buffet and making a bee-line for The Beehive in Boston’s South End! Dive into some of The Beehive delicious fare prepared by executive Chef Rebecca Newell with brunch from 10:00am–4pm while listening to the sultry sounds of Sharon Jones’s Jazz Standards from 11:00m–3pm. Brunch not your thing? Then jump into The Beehive later in the day for dinner from 5:00pm to 1am. Enjoy afternoon music provided by Elenora Bianchini singing Jazz Standards from 3pm-7pm, or get Mom up on the dance floor for Salsa Sunday’s at The Beehive from 8pm-Midnight! Live music and amazing food at one of Boston’s hottest locations all adds up to a perfect Mother’s Day! Regular menu served à la carte and Reservations are highly recommended! The Melting Pot is offering a special 4 Course Mother's Day Menu on Sunday, May 10th, from 11:30am-8pm. Our Dip into Something Different Cookbook. A great present for Mom - specially priced at $24 if ordered at the time of reservation. Tax (5%) and minimum gratuity (20%) will be added to all bills. Coupons, promotional offers and Restaurant.com certificates are not available for use on Mother's Day. It all started in 2001 in an effort to “create” and “celebrate”, and has grown to be one of the best culinary showcases in the city of Boston. On May 12, from 6:30pm–9:30pm, twenty-five of Boston’s best restaurant and chef’s will highlight their creations for noshing and mingling at The Liberty Hotel. Come see the sights, hear the sounds (Music by Boston’s Soul Clap) and meet some of Boston’s best chefs! Check out an incredible food and wine related Silent Auction. Stop by and meet WGBH's Brass Sisters, Queens of Comfort Food, who will be signing copies of their new cookbook Heirloom Cooking. Tickets are $65 per person in advance via www.tasteofbeaconhill.com or $85 per person at the door night of the event (A Portion of proceeds will benefit Taste of Beacon Hill Culinary Scholarship). Advance ticket purchase is recommended as last year’s event sold out in advance and tickets were not available at the door. The event is cash bar. The Beehive is open from 5:30pm–2am on Cinco de Mayo with dinner service until 1:00am. In classic Beehive spirit there will be plenty of surprises and there is never a cover charge! Sombreros welcome! Dinner reservations are highly recommended by calling 617-423-0069. The theme of the current administration of the White House is "Change." But will President Obama change the wine policy? Though, the question should also be posed, should he change it? Back under the administration of Lyndon Johnson, it was decreed that only American wines would be served at official dinners and functions. This policy has remained in effect ever since, for over forty years. No matter how much a President might like French Champagne, only American sparkling wines can be served. The basic reason seems to be that such dinners and functions should showcase the best of America, including our wines. Presenting wines from other countries might be seen as a slight of our own wines. I generally agree that it is probably the best policy to serve American wines at such official dinners and functions. We should be proud of our wine industry. All fifty states now have wineries and plenty of states are producing some very good wines. Let us show the world the quality of the wines we can produce. But, I also think there might be an occasion where we might want to bend that policy. The policy should not be absolute. It should permit some flexibility. Maybe a visiting dignitary wishes to share a wine from their country. Why not let that wine be served at an official dinner, beside our own American wines? Let us use discretion when following the wine policy. You can sometimes find some real bargains in the bin ends and discount racks at your local wine store. I always peruse those areas when I visit a wine store, just in case I see something especially appealing, and at a great price. At a local Kappy's Fine Wine & Spirits, on their special discount rack, I found a bottle of 1996 Abadia Retuerta Cuvee El Campanario. Though it usually retails for $50-60, I purchased it for about $32. Unfortunately, they only had a single bottle for sale. After drinking this wine recently, I definitely wish I had more. Maybe due to my recent experience with the Abadia Retuerta Cuvee Palomar, I have been in the mood to drink more wines from Abadia Retuerta. I was having Shepherd's Pie for dinner and as I perused my wines, I decided on the Cuvee El Campanario. This is a Vino de Mesa, a table wine, made from 100% Tempranillo. But, the cuvee was made from four different groups of Tempranillo, each from a different soil: limestone, graves, clay and sand. Each group was vinified separately. You get the best of the best from each group. The wine was aged in 100% new French Limousin oak for about 18 months and then bottled without filtration. This wine was very dark in color, a rich purple that you definitely would not want to stain your clothes. I inhaled a compelling aroma of blackberries, lilac, vanilla and spice and spent a few minutes just smelling it, savoring its rich aromas. When I finally tasted it, it was not like my expectations. As it was thirteen years old, I felt that the fruit flavors might be more subdued yet they still were lush and juicy, as vibrant as any young wine. Black cherry and ripe plum dominated, especially up front, yet there was much more than fruit. There was also plenty of spice, vanilla, and hints of leather and smoke. In fact, there was a complexity of flavors that really impressed me. It was full bodied with moderate tannins that were well integrated into the wine so they did not overpower. I could easily enjoy this wine on its own or with food and it went well with the meaty Shepherd's Pie. The finish was quite long, dry and satisfying. It was an amazing wine, one I deeply relished. I really enjoyed the Cuvee Palomar from the other evening, but the Cuvee El Campanario easily surpassed it. I think this wine still has plenty of life in it and would last in you cellar for several more years at least, if not even longer. If you can find this wine, I highly recommend you buy it. I will be hunting for more of it for sure. As I have said before, and often repeated by many others in the wine world, the best way to learn about wine is to taste it. All the theory and book knowledge in the world is still not a replacement for actually drinking wine, sipping that fine nectar. Certainly it can be helpful to read about wine, to gain more information about it. But never forget that the key is the taste. These sentiments are echoed in How to Taste: A Guide To Enjoying Wine by Jancis Robinson (Simon & Schuster, Nov.2008, $26). This hardcover book has 208 pages, broken down into six chapters and a glossary. Robinson is a well respected wine authority, and has written or co-written a number of books about wine. With her credentials, you expect her books to be well written, accurate and informative. This book is no exception. Essentially, the book is an educational course that introduces someone to all of the basics of wine. Though those new to wine will most benefit from its lessons, even those with a fuller grasp of the wine world may find some benefit. You will learn how to taste wine, about many of the main grapes, how wine is made, different wine styles, food pairing, and much more. Robinson divides her book into two sections, Theory and Practice. The Theory includes all of the basic information you need, and the Practice section gives you exercises to try to really understand the Theory. For example, you can learn about Sauvignon Blanc and how it differs when it is made in different regions. The Practice exercise will ask you to taste and compare two Sauvignon Blancs, like one from New Zealand and one from France. The Practice reinforces your knowledge and truly helps you perceive the nature of wine. This is an excellent way to teach about wine. I think this book is written in a very reader-friendly style. It helps to take away the intimidation factor of wine. And the practical exercises provide an opportunity to taste and truly experience wine. If you have a friend who wants to learn about wine, then this book would make a great gift for them. Robinson has written another winner. Do you have food allergies? If so, do you worry about those allergies when you dine out at a restaurant? Though I don't have any food allergies, I know several people who do and they must be very careful when ordering strange food, wary that the dish may contain something that could set off their allergy. Well, some assistance has arrived for these people as a new food allergy law goes into effect this week. This is a landmark law, the first of its kind in the country. According to the Food Allergy & Anaphylaxis Network (FAAN), over 12 million Americans have food allergies, about 3 million being children. It is estimated that food-related anaphylaxis results in about 150 deaths and over 50,000 hospital admissions each year. Most allergies involve ingredients such as soy, wheat/gluten, peanuts, tree nuts, dairy, fish, shellfish, and eggs. One of the most famous spokespersons for FAAN is the renowned Chef Ming Tsai, who was instrumental in getting the new allergy law passed. For several years, Ming Tsai worked with Senator Cynthia Stone Creem (D - MA) to pass a bill to make restaurants safer for those with food allergies. This is especially important to Ming as he has a son with food allergies. Ming's work on education about food allergies has taken many forms and he is obviously proud of his success in getting this law passed. This food allergy bill, Senate Bill 2701, was signed into law on January 15, 2009. Most of the law goes into effect 90 days after the signing (about April 15, 2009) though the menu requirement does not go into effect until January 1, 2010. The law requires restaurants to do three things, all of which Blue Ginger already does. 1) Display an approved food allergy awareness poster in the restaurant staff area. Ming Tsai worked with FAAN to create these posters. Compliance with this requirement should be very easy for restaurants. 2) Place a notice on their menus of the customer’s obligation to inform the server about any food allergies. This is the requirement that does not go into effect until 2010. This will cost restaurants some money as they will have to print new menus, or at least add a sticker to existing menus to comply with this requirement. I don't agree with the necessity for this requirement. This matter involves a rather obvious issue that should not need to be placed into print. If you have food allergies, you should, as a matter of course, inform your food servers about it. That is pure common sense so why the need to remind them? 3) Train food protection managers and persons in charge of restaurants on food allergy issues. This will also cost restaurants a bit for the additional training that is required for some of their employees. This requirement will be ultimately beneficial to the public, ensuring restaurants understand how to handle food allergy issues during preparation and cooking. Though I am sure many restaurants are aware of food allergy issues, it certainly can't hurt to ensure that all places have similar training. There is another addition to the bill, which is not a requirement, that allows restaurants to earn a "Food Allergy Friendly" designation. Though all of the specific qualifications for this designation are still being written, one item has already been determined. A restaurant would have to produce a master list of all the ingredients used to prepare the food on their menu and that list would have to be made available to the public. This requirement was inspired by the “Food Bible” used at Blue Ginger. I like the idea behind this designation, having the ability to know all of the ingredients behind any specific dish I might see on a menu. But I suspect that some restaurants may not seek out this designation, worried about giving away too much information on their "secret" recipes. As it is purely voluntary whether a restaurant seeks out this designation or not, I am curious as to how many restaurants, and which ones, eventually do apply for the designation. My new column of "A Passionate Foodie" can be found in the April 15 issue issue of the Stoneham Sun newspaper. This is a weekly column that concentrates on reviews of local restaurants though it also sometimes touches on other food and wine topics. The new column has been published today and will be available online soon. The new article is a review of SwissBäkers, a new Swiss bakery in Reading. The baked goods are authentic, fresh and natural. As well as quite delicious! I have already become a regular customer and highly recommend this bakery. As I mentioned in yesterday's A Spoonful of Ginger post, I wanted to devote a bit more time to talking about Chef German Lam of Glam Foods, LLC. Why did I select one chef to highlight out of the many from that event? Though I had plenty of delicious food at the event, there was a single dish that stood out to me as especially unique. And that dish was prepared by Chef Lam. Chef Lam prepared a French Asian Seafood Head Terrine with Sauce Vert. Initially, I was a bit wary of the terrine, unsure whether I would like it or not. Not all terrines are equal and I have had some terrines that really displeased me. But I gave it a try and it was absolutely delicious, enough that I returned several times for more pieces of it. The flavor was complex, with plenty of fresh fruit flavors, especially Asian pear, and an underlying taste of seafood, the shrimp most prominent. The flavors were well-balanced, nothing being too overpowering, and there was an interesting mix of textures as well, from the soft gelatin to the crunch of the soy beans. It really impressed me and I think it is the type of dish that would appeal to most food lovers. I spent some time talking with Chef Lam and he told me some about how this intriguing dish was created. He started with lobster and shrimp broth, watercress, white miso, dashi, onions, carrots, and celery. Then he used some gelatin to thicken the mixture. After that, he added soy beans, baby shrimp, and salmon and then wrapped it in nori. The Sauce Vert had a sweet chili base, using ichimi (Japanese pepper flakes) as well as cilantro, scallions, fresh waterchestnuts, lemon juice, Asian pear, and olive oil. 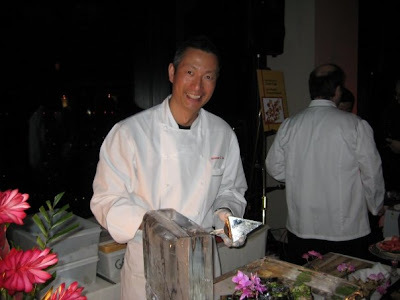 Chef Lam obtained many of his ingredients from the Sun Sun Company (in Chinatown) and Captain Mardens Seafood. Chef Lam was born in Santiago, Chile and throughout his life he was exposed to many different cuisines. He was classically trained at Newbury College and has worked at many high-end places, including the Chatham Bars Inn, the Ritz Carlton Cleveland, the Ritz Carlton Boston, and the Harvard Club. So he definitely has plenty of experience creating high-end cuisine. Currently, he spends much of his time working for his company Glam Foods, LLC. Glam Foods provides cooking/culinary sessions, personal chef services, sports programs, meal planning/budgeting and more. Chef Lam's objective it to "inspire, inform and educate" people on how to create an easy, healthy, and enjoyable lifestyle through cuisine. His motto is “Healthy cooking, healthy living, healthy body.” This is what many people are now seeking. The Seafood Terrine is representative of Chef Lam's philosophy of cooking. First, it is fusion, combining elements of different cuisines, stemming from his exposure throughout his life with various cuisines around the world. Second, it is made primarily with local produce, which is important to Chef Lam. He tries to cook within the seasons, with whatever is most fresh. Third, it is healthy, something that is extremely important to Chef Lam. He is trying to promote a healthier attitude towards food, but without any sacrifice of quality or taste. This dish certainly had plenty of delicious taste. Fourth, it was memorable, another quality valued by Chef Lam. He wants you to remember his food, for it to stand out among other dishes. He accomplished that with me, as his terrine was the most memorable dish to me at the event. Lastly, he considers what he does as a form of art. That too is appropriate for the terrine. As the owner of Glam Foods, Chef Lam tries to instill his philosphy and values into his clients. He sees himself more as a coach than educator to assist people with their own cooking. He teaches more than just recipes, but tries to show them a preferable lifestyle with delicious, healthy food at the center. He does more than create food for you, but shows you the reasons behind the cuisine. He is providing similar services to the Waltham Public School system, helping to make school lunches healthier as well as educating the children on healthier alternatives. I was impressed with Chef Lam's passion, as well as his culinary philosophy. I hope to taste more of his cuisine in the future. If you are seeking personal chef services, or want to to learn more about healthy cooking, then check out the services offered by his Glam Foods. Marisa Iocco, Boston's only Italian-born female chef, makes her first professional foray outside of Boston city limits, as the newly named Executive Chef of Spiga Trattoria Italiana in Needham. As the cutting-edge culinary talent behind Galleria Italiana, La Bettola, South End Galleria, Bricco, Mare and Umbria, respectively, Iocco will undoubtedly raise the bar on Italian cooking in the metrowest area, serving big city food at little town prices (appetizers $9-12, primi $16-18, secondi $19-28, dolci $6-8). Spiga, a surprisingly authentic Tuscan “villa” improbably located on a side street just off the highway, is rolling out the red carpet for Iocco … adding a landscaped patio, silk curtains, fresh paint, and an 8-seat wine bar. Spiga also boasts all-new management, staff and website. Chef Iocco’s spring 2009 menu debuts on April 15. The 62-seat trattoria serves lunch and dinner daily. By day, tables are casual and service is quick. A roster of ten salads will be offered. Each is also available as a hot panini. Half a dozen brick oven pizzas and house-made pastas round out the $8-12 menu. By night, white tablecloths come out, and antique sconces reflected in tall mirrors create romantic ambiance. "Spiga" comes from the Italian word for "wheat sheaf," the kind that was used centuries ago to bake bread. The restaurant’s logo is a wheat sheaf, whose familiar shape is embedded in stained glass on the front door. Proprietor is Carmelo Iriti and General Manager is Narciso Balboni. --Tiramisu Scomposto (deconstructed), Tuscan Melon Soup, and Iocco’s signature Bread Pudding – see attached recipe – plus other desserts will all be made in-house. Don't Miss: Iocco’s creative and addictive Parmigiano Oreo Cookie: two cheese tuiles with soft, cheesy mashed potato-parsnip filling, just $4.50 per order. Bio of Executive Chef Marisa Iocco: Born in Orsogna, Italy, Marisa studied art and architecture before setting her sights on a career in food. She studied culinary arts at the renowned Villa Santa Maria before moving to Boston in 1990, where she opened Galleria Italiana with a partner. It became the hottest Italian restaurant Boston had ever known. In 1997, Marisa opened La Bettola, a critically acclaimed incubator for Italian fusion cuisine. It was followed a few years later by the back-to-basics South End Galleria, which shuttered in 2002. On extended hiatus in Italy, Marisa researched recipes from the top chefs in Rome, Milan and Tuscany. Returning to Boston, she joined forces with a local restaurateur to operate Bricco, which became Boston’s premiere spot for cutting edge Italian cuisine in a vibrant urban setting. Marisa’s next challenge was creating a menu for Boston’s first ristorante showcasing Umbrian cuisine. Umbria opened in 2004 and built momentum rapidly; it was named “Best New Restaurant in Boston” by Boston Magazine that year. In 2006, Marisa’s previously under-the-radar profile catapulted to national attention for her ambitious, organic seafood menu at Mare, named “Best New Restaurant in America” by Esquire, one of 80 Top Places in the World to eat by Conde Nast Traveler, and lauded in Food & Wine as one of the best new places to dine in Boston. Marisa takes the reigns at Spiga in Needham, MA in April 2009. Later this year, she hopes to launch a line of all-natural, prepared meals called Food With Love. In her spare time, she travels, writes, plays poker and blackjack, swims, and spends time with her Labrador retriever, Tosca. Good food and a good cause. Always an excellent pairing. I recently attended the 5th Annual “A Spoonful of Ginger” Food Tasting Event to benefit the Joslin Diabetes Center’s Asian American Diabetes Initiative. A number of local chefs participated including Jasper White and Henning Vatborg of Summer Shack, Joanne Chang of Flour Bakery and Myers + Chang, Charles Draghi of Erbaluce, German Lam of Glam Foods, and many more. It was held in the The State Room, atop 60 State Street, with a beautiful view of the city at night. The mission of the Asian American Diabetes Initiative (AADI) is to raise awareness about diabetes and enhance the quality of life and health outcomes of those living with diabetes in the Asian community through research, education, outreach and improved diabetes treatment. Asian Americans are nearly twice as likely to develop diabetes as the general population – more than 10 percent of all Asian Americans have diabetes and even more remain undiagnosed. I am sure almost everyone know someone with diabetes. I know and have known numerous people affected, to one degree or another, by diabetes. One of my cats even has diabetes and requires insulin injections twice a day. I have enough trouble injecting my cat that it is almost hard to imagine how people with diabetes must inject themselves or loved ones. Diabetes research is a worthy cause and deserves recognition and support. Prior to the ribbon cutting, opening the evening, there was a very nice taiko drum set. The two drummers were very talented and it was fascinating to watch their performance and hear the throbbing drums. Mayor Menino was on hand to help with the ribbon cutting and opening ceremonies. Councilor Sam Yoon was also on hand at the festivities. Near the end of the evening, all of the chefs got together for pictures. Though it was difficult to get all of the chefs into a single picture. Kudos go out to all of these chefs for the excellent food they prepared. Attendees were able to move from table to table, sampling food and returning for seconds for those dishes that were especially delicious (or even thirds!). Complimentary wine, beer, and soft drinks were also provided. Despite all of the people at the event, the wait for getting food at any table was very short, if even at all. Everything seemed to run very smoothly, one of the best organized events I have attended in some time. I even had the chance to speak a bit with some of the chefs. Overall, I was very impressed with this event and very much enjoyed the food. Here are some photos of several of the tables I visited. This table was shared by Chef German Lam of Glam Foods, LLC and Chef Charles Draghi of the Erbaluce Restaurant. You can read a separate post about Chef Lam tomorrow, so you will be able to learn more about him. I spoke with Chef Draghi and he really intrigued me about his new restaurant. For example, their rack of wild boar is one of their signature dishes and that certainly appeals to me. Plus, he mentioned that his wine list contains many less common Italian wines, something to intrigue any wine lover. I am currently trying to plan a visit to Erbaluce to check it out. This was the enticing sliced beef at the table of Chef David Wong of Shabu-Zen. This is Asian hot-pot cooking, similar in some ways to fondue. I am a fan of Joanne Chang's Flour Bakery in the South End. So I expected that whatever they served would be delicious. And I was not wrong as these upside down apple cakes were excellent. Chef Hing Soo Hoo of Chinatown Cafe had one of the most eye-catching tables with this poultry. The meat was quite flavorful and moist, and seemed very popular. I can't turn down raw tuna and Chef Ting San of Oishii Boston provided cubes of tuna on a stick with the crunchy rice pearl. I must admit I ate a fair number of these. There was plenty of other delectable food at this event but I wanted to offer a sampling of some of what I found. And as you savor the photos of the food, please also give some consideration to the Joslin Diabetes Center’s Asian American Diabetes Initiative. Help support this worthy cause.